Columbus, Ohio (March 13, 2017) – The 37th National Veterans Wheelchair Games are coming to Ohio this summer! 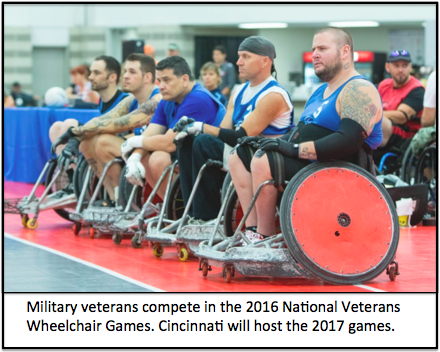 Cincinnati will host the games July 17 – 22, with over 600 veterans from the United States and Great Britain competing in the events. The games are organized by the U.S. Department of Veterans Affairs and the nonprofit Paralyzed Veterans of America. VFW Ohio Charities is a top financial sponsor of the 2017 games, donating $53,000 to the event. VFW of Ohio Charities’ support of the games has been made possible because of charitable video raffle games at VFW posts throughout Ohio. Since the video raffle program began in 2011, over $26.5 million has been raised for charities like the wheelchair games. But veterans and fraternal leaders are concerned that the video raffle program is in jeopardy. In 2013, Attorney General Mike DeWine stated that the program was illegal and ordered it shut down. The groups disagreed and quickly obtained a temporary restraining order allowing the program to proceed, pending a court decision, which is expected within weeks. The groups are hopeful they will win their court case and continue to be able to raise vital funds from veterans and their members to support their posts and charities at no cost to taxpayers. Columbus, Ohio (January 11, 2017) – Ohio charities have benefited from over $25 million in revenue since 2011 thanks to a video raffle program implemented by veterans and fraternal organizations. The Ohio Veterans and Fraternal Charitable Coalition (OVFCC) announced this week that its video raffle program has reached a major milestone by hitting the $25 million mark in funds raised for charity. They raised over $7,250,000 in 2016 alone. The funds directly benefit veterans’ posts, fraternal lodges and hundreds of local charities. Fifty percent of the revenue supports the posts and lodges and fifty percent supports local charities in communities across Ohio. For the Ohio State Aerie of the Fraternal Order of Eagles, OVFCC board member and past president Jim Donaldson says that the charitable electronic raffle project is important to an effort that is near and dear to his heart. 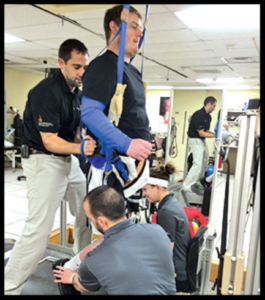 Ohio State University Wexner Medical Center NeuroRecovery Network patient on bodyweight-supported treadmill training. The electronic raffle program has caused other OVFCC member organizations to see a significant rise in revenue to their clubs and posts, allowing them to contribute back to their respective communities and charities in many ways. But veterans and fraternal leaders are concerned that the video raffle program is in jeopardy. In 2013, Attorney General Mike DeWine said that the program was illegal and ordered it shut down. The groups disagreed and quickly obtained a temporary restraining order allowing the program to proceed, pending a court decision, which is expected within weeks. The groups are hopeful they will win their court case and continue to be able to raise vital funds to support their posts and charities at no cost to taxpayers. The OVFCC is the voice of more than 2.1 million members and their families who are active in more than 1,700 posts and clubs throughout the State of Ohio. The OVFCC is an unincorporated association that was established in 2003 to achieve consensus and develop policy on various issues affecting Ohio veterans and fraternal organizations. Member organizations have input regarding charitable gaming as well as legislation, rules and regulations that impact veterans and fraternal organizations. OVFCC President Bill Seagraves can be reached for further comment at (614) 222-1611. Columbus, OH (October, 2016) – When Gertrude Trowbridge was eight years old she began learning the art of quilting. Since then, the Powell resident has been widely recognized for her quilting skills, winning county and state championships. But that’s not what brings her the most joy. 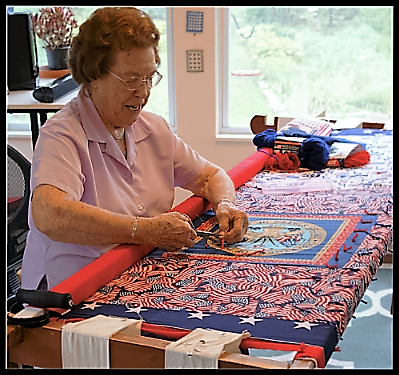 Gertrude’s true passion is crafting handmade quilts and delivering them to the Ohio Veterans Home in Sandusky, where they are given to veterans and used as decorative bed coverings. Gertrude’s late husband Robert Trowbridge was an Army veteran, 37th Division where he served in the South Pacific during World War II. Six of her family members also served in the military. During the final years of his life, Mr. Trowbridge suffered from dementia and received outstanding care at the Veterans Home. Gertrude wanted to volunteer to help the home in some way to show her appreciation, but living over 100 miles away made it difficult. 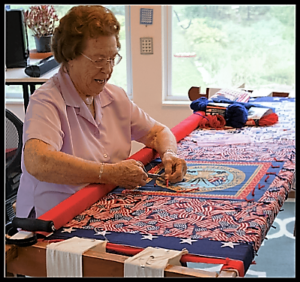 Then she learned the home needed bed coverings, so she put her quilting talents to work by making decorative, patriotic quilts for the home’s residents. Although her husband passed away in 2011, Gertrude has continued making quilts. To date, she has made nearly 300 quilts for the home, and she doesn’t plan on stopping anytime soon. Her goal is to make at least 427 quilts, matching the total number of beds in the home. Each quilt is handmade on Gertrude’s traditional style quilting frame, taking several days to complete, working many hours each day. Gertrude uses patriotic fabrics and yarns to brighten up the veterans’ rooms. VFW of Ohio Charities learned about Gertrude’s service when she was profiled in a Columbus Dispatch article in June 2015. The charity’s director Bill Seagraves reached out to Gertrude to help with the expenses of producing the quilts, which she had been paying for at her own expense. This year VFW of Ohio Charities has provided $1,000 to Gertrude to help with her expenses and has committed to pay for the cost of materials and travel for as long as she’s willing to make the quilts. “With all of the hard work and countless hours Gertrude dedicates to helping brighten the lives of Ohio’s veterans in need, providing funds to pay for her materials and expenses is the least we can do,” said Seagraves. Funding to help Gertrude and hundreds of other veterans charitable causes in Ohio is made possible by revenue generated from the Ohio Veterans and Fraternal Charitable Coalition (OVFCC) charitable electronic raffle program. In 2016 alone, the project has raised over $5 million to support posts, lodges and the charities they support. Since its inception in 2011 the charitable electronic raffle program has raised over $23 million to support posts, lodges and charitable causes. In 2013 Attorney General Mike DeWine felt that the charitable electronic raffle program was illegal and ordered it shut down. But veterans and fraternal organizations disagreed and quickly obtained a temporary restraining order allowing the program to proceed, pending a court trial which is set for later this month. The OVFCC and their charities are hopeful they will win their court case and continue to be able to raise vital funds from their members to support their posts and charities at no cost to taxpayers. Columbus, Ohio (April 25, 2016) – The Ohio Veterans and Fraternal Charitable Coalition (OVFCC) announced this week that its video raffle program has reached a major milestone by hitting the $20 million mark in funds raised for charity. The funds directly benefit veterans’ posts, fraternal lodges and hundreds of local 501(c)(3) charities; fifty percent of the revenue supports the posts and lodges and fifty percent supports local charities in communities across Ohio. This past Labor Day weekend the Ohio Veterans and Fraternal Charitable Coalition’s charitable video raffle program hit another major milestone; $16 million raised for our members and the charities they support. Even more impressive is that the program has raised over $4 million for charity this year alone! This is truly remarkable and could not have been accomplished without the support of our organizations and their individual members. It is a great example of veterans and their supporters helping veterans in need! The charitable video raffle program has been operating under a temporary restraining order against the State of Ohio since December of 2013 after abiding by the Attorney General’s request to shut down the program. Since receiving the TRO, the program has generated in excess of $9.4 million for our organizations and their charities.